GOOD THINGS COME IN SMALL PACKAGES. 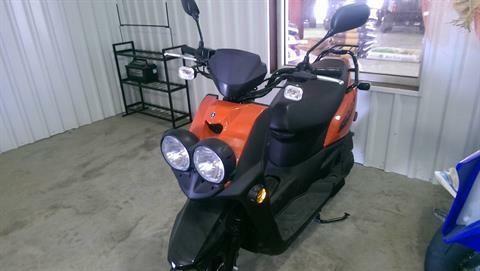 Back by popular demand, the sporty Zuma is a fantastic combination of fun and practicality. Think of it as a very trick scooter or a very small sport-utility vehicle, the Zuma's up for anything. Super-sporty styling and bodywork create a racy package with an aggressive profile and riding position. Wide front apron and floorboards enhance Zuma’s sporty profile while providing exceptional wind/weather protection and all-day comfort. Headlight system features dual bulbs with housings mounted atop (vs. recessed) the fairing for great visibility and a sporty finish. Huge underseat storage compartment, perfect for hauling schoolbooks or groceries. Plush dual seat is long and wide for improved rider and passenger comfort. Sturdy rear cargo rack boasts stainless finish and features extensions that double as passenger grabrails. Easy-to-read instrument panel features turn signal, high-beam and low-oil indicator lights. Long wheelbase (50.2-inches) and large dimensions (74.4 L x 27.8 W x 43.7 in. H) enhance rider comfort with roomier ergonomics. Five-spoke cast wheels wear fat, low-profile 120/90-10 front and 130/90-10 rear tires that deliver tons of grip and attitude. Telescopic fork features beefy outer tubes for strength, while slider shrouds help protect inner tubes from debris. Telescopic front fork with 2.6-inches of travel smoothly soaks up what the road throws the rider’s way. Single rear shock with 2.4-inches of travel ensures plush ride quality in either solo or two-up mode. 155 mm hydraulic front disc and rear drum brakes combine for serious stopping power. Feisty 49 cc, air-cooled two-stroke engine features a high 7:1 compression ratio for strong, usable power—perfect for around-town performance. Reed-valve induction provides excellent throttle response and power delivery. 14 mm Teikei carburetor ensures seamless fuel delivery and crisp throttle response. Fan-assisted cooling system keeps engine temperatures reliably under control, even while idling at stoplights—for maximum efficiency and longer engine life. Exclusive Autolube Oil Injection System ensures no mess or hassle of premixing fuel and oil. Easy-to-read indicator light located on instrument panel alerts rider when oil level gets low. Fully automatic, V-belt transmission ensures easy, twist-the-throttle-and-go operation. DC-CDI system provides precise, high-voltage spark for seamless engine performance and excellent reliability. 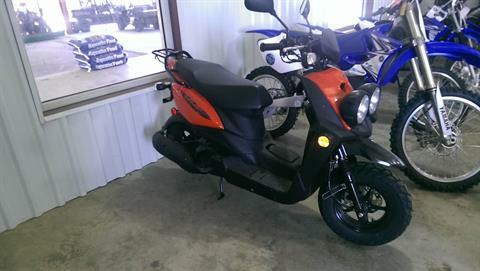 Back by popular demand, the sporty Zuma is a fantastic combination of fun and practicality. New carburetor settings and exhaust catalyzers for clean exhaust emissions. 49 cc of reed-valve-inducted, Autolube-injected, two-stroke performance keeps the Zuma at the head of the 50 cc pack. Fully automatic transmission and pushbutton electric starting make the Zuma super-convenient for all riders. There’s room for two atop the Zuma’s seat and lots of locking storage beneath it.